This is an extract from an article by Danny Fortson in yesterday’s Sunday Times (behind paywall) which never made it into the Irish edition, revealing (for the first time) that Denis O’Brien owes hundreds of millions to Anglo. International Finance Corporation, the private finance arm of the World Bank and an evangelist for corporate governance, has been a key Digicel backer since the beginning. It has provided hundreds of millions in cheap finance, bankrolling the company’s expansion across more than 30 countries. The Moriarty findings have led some to question whether IFC will rethink its relationship with O’Brien, who is valued at £2.5 billion in The Sunday Times Rich List. “Regarding the Moriarty report, we are aware of it and are monitoring the situation,” said the IFC. Digicel, meanwhile, has lurched into the red. According to its most recent accounts, filed last month, it plunged to a $25m (£16m) loss for the six months to the end of September. Its debts: $4.6 billion. The profit fall was not strictly down to business reasons. By nearly every metric, in fact, the company did well. Subscribers. Revenues. Earnings. They were all up. Its dip into the red was caused by a $95m lump sum that O’Brien took out of the company through a dividend. During the same period he took a €25m dividend out of Aergo Capital, his aircraft leasing business. Since the Irish property bubble burst, taking the banking system and economy down with it, several of the country’s most successful businessmen have been reduced to relative penury. The most high profile was Sean Quinn, known as Ireland’s richest man before he went bust. O’Brien has managed to survive, though not without bruises. His most painful investment has been Independent News & Media, whose stable includes the Irish Independent. Between 2006 and 2009 he built a 26% stake at a cost of more than €510m. During that period the group’s newspapers ran articles critical of him. He engaged in a bitter wrangle over the company’s direction with Sir Tony O’Reilly, the long-time chief executive. O’Brien eventually won his campaign to force out O’Reilly, who retired in 2009. Financially, however, the business was a disaster for him. The publisher was hit hard by the economic slowdown and in 2009 it was forced into a debt-for-equity swap that virtually wiped out investors. O’Brien, still the biggest single investor, was left nursing a €500m paper loss. Worse, he would have to look elsewhere to repay Barclays Bank and Anglo Irish Bank, which funded the share spree. According to publicly available information, he may struggle to fill the gap. Communicorp, his holding company, which owns several top Irish radio stations, is saddled with €123m of debt and notched up a €2m loss in 2010, the last available figures. In Jamaica, the Fair Trading Commission is taking legal action to reverse Digicel’s takeover of a rival, Claro, which gives O’Brien’s company a more than 80% share of its biggest market. David Miller, executive director of the FTC, said the case is “one of the biggest of its kind with respect to the breach of the [competition] act”. Digicel could be hit with millions in fines or be forced to break itself up if a judge finds for the FTC. A court date has been set for January 31. There have also been ructions in Europe. The Irish Bank Resolution Corporation (IBRC), which includes the rump of the failed Anglo Irish Bank, last year tightened its grip on the PGA Golf Catalunya, one of the courses owned by O’Brien’s golf holding company, Murrayhill. The deal gave the IBRC a claim over shares in the club as part of a refinancing. 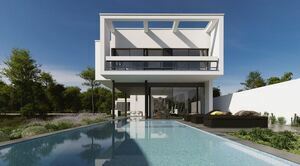 The loss-making resort has struggled to shift high-priced villas in recession-hit Spain. O’Brien’s spokesman denied that the tycoon was feeling the pressure. “Any suggestion that Mr O’Brien’s finances are under strain is laughable,” he said. The Moriarty Tribunal rumbled to its conclusion last year — 14 years after it started. During that time, O’Brien grew increasingly prickly about speculation surrounding his business and his alleged role in swaying the outcome of the mobile licence auction. He sued one of his group’s journalists, Sam Smyth, over comments on the mobile auction. Smyth was fired last year from the Today FM radio station, though he still writes for the Irish Independent. Willie O’Reilly, Today FM’s chief executive, quit soon after the dismissal. O’Brien has, of course, collected a bevy of high-profile supporters along the way, who celebrate him as a hard-charging entrepreneur and a genuine philanthropist. He has undeniably done well by daring to go where others won’t, such as Haiti, the poorest country in the western hemisphere. In Jamaica, he built up a dominant position from a standing start by doing what the incumbent, Cable & Wireless, did but much better. Bill Clinton speaks warmly of his work on behalf of the Clinton Global Initiative, the organisation he founded to fight global poverty. The Irishman’s exploits aren’t limited to such humane endeavours. Last November he agreed to pay half the £1.25m salary of the Republic of Ireland football coach, Giovanni Trapattoni. The contract was a renewal of one first agreed two years ago. He can be supremely charming and also aggressive, according to those who have done business with him. There is no shortage of people who are willing to dish the dirt. Barry Maloney, once a close friend, met him when they were teenagers and served as chief executive of Esat for five years. Now a venture capitalist at Balderton Capital, he gave evidence to the Moriarty Tribunal. He told the inquiry that O’Brien had referred in a private conversation to political payoffs related to the mobile auction. O’Brien has said he was kidding. The picture that emerges of the tycoon is a confusing one. Is he an ambitious entrepreneur who has sailed too close to the wind? Is he one of the world’s great philanthropists, subjected to potshots from bitter rivals? Is his debt-fuelled empire in trouble, or is he simply taking money out of the business because it’s there? O’Brien was unavailable to comment for this article. What is certain is that he divides opinion. 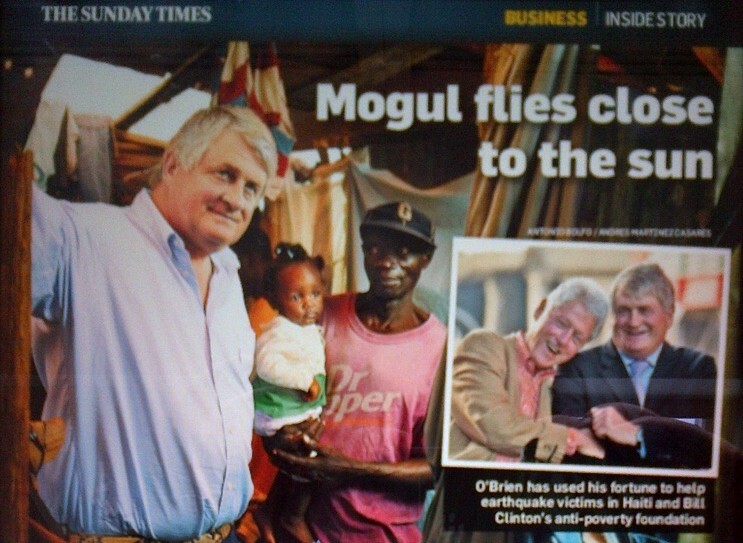 When the Irish government convened a forum in October of the country’s top businessmen and foreign dignitaries — including Clinton — O’Brien was front and centre, despite the publication of the Moriarty report just seven months previously. For some, it was too much, including Maloney, who pulled out of the event in protest. 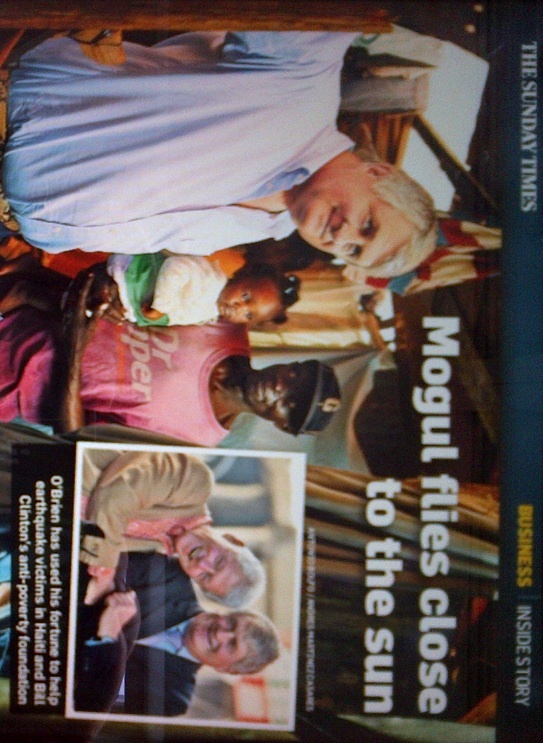 Posted in Misc and tagged Anglo, Debts, Denis O'Brien at 9:15 am on January 16, 2012 by Broadsheet.